First official record: an entry in the Revels Account Book records a performance on 1 November 1604 of "The Moor of Venis" by "Shaxberd." 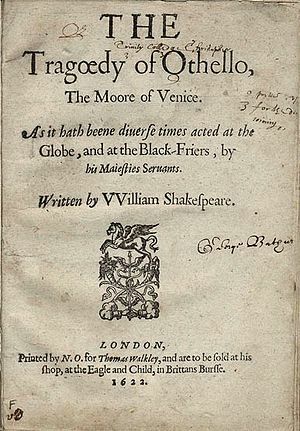 First published: version of the play published in quarto in 1622 as The Tragœdy of Othello, The Moore of Venice (printed by Nicholas Okes for Thomas Walkley). The Folio text appears under virtually same name; The Tragedie of Othello, the Moore of Venice. Additional information (publication): although the 1622 quarto text is not usually considered a bad quarto, it does differ significantly from the Folio text; F1 features roughly 160 lines not in Q1, and Q1 features twelve lines not in F1. The word ordering in some sentences is also different at several points throughout the play. In his 2001 edition of Q1 for the New Cambridge Shakespeare: The Early Quartos series, Scott McMillin argues the quarto was created by a professional theatrical scribe listening to the actors performing the play, and in this sense, it represents as pure a performance text as it is possible to have. First recorded performance: in the banqueting hall at Whitehall Palace on 1 November 1604, by the King's Men. Evidence: obviously the play was written by November 1604, and conventionally, it tends to be dated 1603–1604. An important element in this dating is Shakespeare's use of sources. For example, "burn like the mines of sulphur" (3.3.331), "one entire and perfect chrysolite" (5.2.143), and "Drops tears as fast as the Arabian trees/Their medicinal gum (5.2.349-350) are all thought to allude to Philemon Holland's translation of Pliny the Elder's Naturalus Historia, published in 1601. Additionally, Shakespeare probably took the information regarding the Turkish invasion of Cyprus (found in 1.3, 2.1 and 2.2) from Richard Knolles' General History of the Turks, which contains an epistle dated 30 September 1603. Specifically, he may have got the name Signor Angelo, mentioned in the sailor's report (1.3.16), from Angelus Sorianus, a Venetian commander discussed in Knolles. Also, the sailor's description of Turkish tactics, "The Ottomites, reverend and gracious,/Steering with due course toward the island of Rhodes,/Have there injoined with an after fleet" (1.3.34-36), may have come from Knolles' description of the Turkish fleets' actions prior to the siege of Nicosia. This suggests September 1603 as a likely terminus post quem. A possible terminus ante quem could be March 1604, when Philip Henslowe paid Thomas Dekker and Thomas Middleton for Part 1 of The Honest Whore, which contains the line "more savage than a barbarous Moor." Whilst not specific enough to be a definite reference to Shakespeare, it is known that Othello was immensely popular from its very inception, and such a reference would certainly have made sense to an audience at the time. It has also been argued that the play may have been written with an eye to pleasing the new king, James I. James was interested in Turkish history, and had written a poem in 1591 about the Battle of Lepanto. The poem was republished upon his accession in 1603, and a play set amongst the events which ultimately led to that battle would have had a special interest for the king. This would also support a date of 1603–1604. However, following H.C. Hart's 1928 edition of the play for the first series of the Arden Shakespeare, E.A.J. Honigmann dates the play mid-1601 to mid-1602, believing it to have influenced the bad quarto of Hamlet (in existence by July 1602). For example, he cites the substitution of the name "Montano" for "Reynaldo." Montano occurs in no other play except Othello, and Honigmann believes the actor who worked on Hamlet Q1 played Reynaldo, but had played Montano in an earlier production of Othello, and unconsciously mixed up the names. Additionally, MacDonald P. Jackson's pause analysis of the plays places Othello closest to Hamlet, Troilus and Cressida, Twelfth Night and Measure for Measure, in that order. The "average date" for these four plays is 1602. In his 2006 Oxford Shakespeare edition of the play, however, Michael Neill discusses Honigmann and Jackson's arguments, finding them suggestive, but not wholly persuasive, and ultimately settling for a "compromise date" of 1602–1603.